Thanks to everyone who helped to make the meeting a resounding success! Join us during the year at one of our many specialty meetings, and see you at next year's Annual Meeting in New Orleans, Louisiana, 10–14 January 2016! Browse and search abstracts, authors, recorded presentations, and supplemental materials. You're invited to present at the 96th AMS Annual Meeting, 10–14 January 2016 in New Orleans, Louisiana. Abstract submissions are now being accepted. "23|5 Talks" feature various views and perspectives on weather, water, and climate from some of the most engaging, thought-provoking people in our fields. See more 23|5 Talks and other videos from the meeting on YouTube. 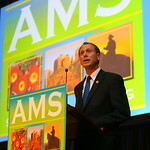 Remember the good times you had at the Annual and check out photos from the meeting, now up on the AMS Flickr page. Element DISPLAYSUMMARIES is undefined in OBJECTPARAMS.